What nostalgia looks like in 2017 isn’t what it looked like at the dawn of video games. The virtual worlds in which we play have long hinged on callbacks to outdoor things, countryside adventures, wooded escapes or play-fighting in the grass. Yes, many of our childhoods were spent in backyard kid gangs, dreaming of brotherly knighthood, mystical water fairies or whatever. Endless Steam inventories of fantasy role-playing games reflect this obsession with the natural, pure way things were. My childhood was no different, at least half the time, when I wasn’t on the internet. Lately, the gaming stories that most absorb me aren’t set in some genero-fantasyland Garden of Eden—for me, it’s the software of my youth. In one of these games, blossoming love is depicted as a few coy lines of song lyrics in a well-timed AOL Instant Messenger away message (Emily Is Away). In another, adventure is sharing pictures of your face (with make-up) with a stranger from a video game (Cibele). War is twelve frantic, biting text messages your furious friend sends in quick succession (Mystic Messenger). Mystery lies deep in a vintage video database (Her Story). The thrill of new creation is the first few lines of code you wrote in a blank, intimidating command prompt (HackMUD). Your enemies are pop-up windows (Kingsway). Over the last few years, a few standout indie games have successfully hooked me with fake interfaces, setting their games amid the windows and menus and mechanics that mimic the way we interact with real-life digital technologies. It’s not just developers putting a stack of chips on our nostalgia for dial-up modems and Compuserve; it’s artists legitimizing the primary medium through which many of us engage with our surroundings and each other. These games use texting interfaces, Facebook chat, folders in Mac’s Finder or command prompts as reference points for how we interact with the game’s content. That way, there’s a 1:1 correspondence between form and content. Generally, both occupy the digital world. In the 2016 smartphone dating sim Mystic Messenger, the story goes that the player stumbles upon a smartphone app that, in fact, is the gateway to five potential love interests’ private chat. The plot unfolds through e-mails, chat messages and texts sent, in many instances, as push notifications to the player’s phone. So when the businessman Jumin Han leaves a meeting and wants to complain, he’ll text the protagonist directly to their phone, which, also, is the my phone. That way, the player and their in-game character relate to the Mystic Messenger app in the same way, closing the gap between the two. As these love interests divulge more of their secrets and confide in the protagonist, I felt more and more spellbound by the game because it convinced me that I was the protagonist. This is what hooks me. As I age, I find it harder to slip into whatever fantasy alter-egos I conceived of as a child—the embarrassingly earnest characters my friends and I would role-play in my backyard, which later I’d dutifully replicate in any role-playing game’s character creator. So large and detailed is the collective genero-fantasyland in video games that it’s startlingly easy to forget that, for many of us, our alter-egos aren’t limited to elves, wizards and warrior-princes; why is there no love in video games for the persona I curated on MySpace and Livejournal? Where can I see my very best Instagram selfie or my very worst Xanga poem reflected in a game? These emotional planes are ripe for game designers to stratify into game mechanics. Years of my life were absorbed by the MMORPG Final Fantasy XI, and until I played the 2015 narrative game Cibele, no media had ever helped me access that part of my identity—one that lacks both relatability and glamour. After school got out, I had stopped meeting other neighborhood kids to stick fight in a the cul-de-sac around the corner; I was plugged in. I was a black mage in FFXI, and to those who knew me, I was naive, but wise, a calming presence during raids but a forceful one when some injustice arose among in-game friends. Sometimes, FFXI was simply a blank canvas for identify reconfiguration and a thing to do with my hands while I learned about the strangers with whom I spent hours every day. Cibele is a game about that (albeit, a little sexier). In Cibele, the player navigates a fake interface of developer Nina Freeman’s 2008 desktop, an intermediary space between her real-life friends and her burgeoning online romance in the made-up MMORPG Valtameri. On that desktop, she stored poems in disorganized folders, curated pictures of herself and a backlog of e-mails from girlfriends who, lately, she had started seeing less. 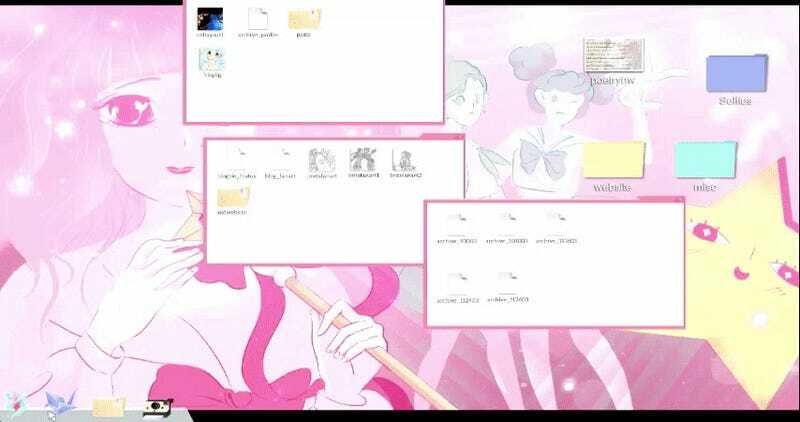 In the bottom left corner of her desktop is an icon for Valtameri, where Freeman is the character Cibele. Playing Cibele inside Valtameri, Freeman’s voice (also, the player’s) tells her romantic interest, Ichi, “Sorry I missed your call last night. . . Want to do a run together?” In the ensuing conversation, Ichi tenderly asks Cibele to call him “Blake.” Search results for flights between JFK and LAX airports pop up on-screen. (You can “X” out of them and go back to playing.) All the while, the player, a mage, is putting out small fires in-game. Back in my childhood bedroom, whenever I was poised to open up to a close raiding buddy in FFXI, my desire to be known completely was always balanced out by a now-outdated fear of some masked, unknown internet stranger somehow finding my address. That fear was potent and beguiling. It’s not a feeling that movies, television or music had replicated in me, so playing Cibele was like watching someone do surgery on an organ I forgot I had. The game, which was inspired by Freeman’s time in FFXI, legitimized a part of me that no media had ever legitimized. I finished Cibele feeling gut-punched as all my pent-up memories of FFXI flowed out of me. These are the internet personae we forget about, and games are in the position to help us understand what they meant to us. It’s tempting, though, to limit our digital personae to avatars and social media accounts where we may be playing a character. Less crystallized for me was another identity: a very good listener over AOL Instant Messenger. Discerning friends’ moods through some combination of their away message, buddy profile lyrics and sentence length was a sort of game, and winning meant knowing enough to help out. In that moment, Emily Is Away was a more persuasive bid for my nostalgia than sadly milling about my home’s backyard, a backyard that now belongs to another family and their children. I wonder what sort of games those children will play. Will their fantasies inside that half acre of grass and holly trees and wild-growing bushes be reflected in their games? Or will it be other media and their digital identities, the stuff of their youth, that their games will take as inspiration?